When Will the Next Great Quake Strike Northern California? The Great 1906 San Francisco Earthquake is the most powerful in Northern California's recorded history. New studies of this earthquake are yielding important clues about how and when such events occur. With this improved knowledge we can better prepare for future strong temblors. The upper photograph, taken from a tethered balloon five weeks after the great earthquake of April 18, 1906, shows the devastation wrought on the city of San Francisco by the quake and subsequent fire. In the city and surrounding region, at least 700 people were killed and losses totaled more than $400 million (1906 dollars). The lower view of San Francisco, taken from a similar vantage point atop a tall residential apartment building in 1996, shows the development of the densely populated city since the great quake. If a similar earthquake occurred in Northern California today, after many decades of rapid urban growth, thousands of people would likely be killed, and economic losses might be in the hundreds of billions of dollars. On April 18, 1906, a powerful earthquake (magnitude 7.8) struck Northern California. During the minute of violent ground shaking, San Francisco and many smaller cities were devastated. At least 700 people were killed (the actual death toll probably was 3 to 4 times greater), and losses totaled more than $400 million (1906 dollars). The ground broke along the San Andreas Fault over nearly half the length of California (about 300 miles). Analysis by U.S. Geological Survey (USGS) scientists shows that ground movement along the fault (slippage) locally exceeded 25 feet near both Point Reyes and Shelter Cove, 150 miles apart on the coast north of San Francisco. In this trench dug across the San Andreas Fault near Loma Prieta, California, U.S. Geological Survey scientists identified soil layers disrupted by the last giant earthquake before the Great 1906 San Francisco Earthquake. 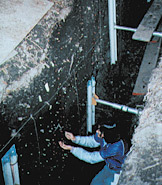 Radiocarbon dating of plant remains from the layers in the trench indicates that this quake occurred about A.D. 1600, before written historical records were kept in California. The "Great 1906 San Francisco Earthquake" is one of the strongest ever recorded on the North American continent. If a similar earthquake occurred in Northern California today, after many decades of rapid urban growth, thousands of people would likely be killed and economic losses might be in the hundreds of billions of dollars. Such an event would easily be the worst natural disaster in the Nation's history. How soon is such an event likely to happen? Recent research offers some answers by providing new insights into the 1906 quake and the San Andreas Fault system. For example, geologists have dug trenches across the San Andreas Fault to find out how often very powerful temblors occur in Northern California. In these trenches, they have identified soil layers disrupted by a great earthquake before 1906. Charcoal in these layers has been shown to be about 400 years old. These and similar studies in Southern California, as well as thousands of years of historical records from China and Japan, tell us that giant earthquakes on faults like the San Andreas tend to occur every few hundred years. All this evidence suggests that another shock as powerful as the 1906 earthquake is not likely to strike Northern California soon, probably not for at least 100 years. In the Great 1906 San Francisco Earthquake, the ground broke along the San Andreas Fault over nearly half the length of California (about 300 miles). Ground movement along the fault (slippage) locally exceeded 25 feet near both Point Reyes andShelter Cove. Scientists believe that future giant earthquakes will occur only after the slow and steady (about 3/4 inch per year) relative motion (red arrows) of the Pacific and North America Plates has built up stress along the fault to 1906 levels. This "recharge"of stress should take from 130 to 400 years at different sites along the fault. The photo at right shows a fence near Bolinas, about 20 miles southeast of Point Reyes, that was offset 8 1/2 feet by slippage in the 1906 quake. Unfortunately, this reassuring result is balanced by other, more somber findings. Although a great earthquake is not expected soon, stress on the San Andreas Fault system has built up again after having been relieved by slippage in the 1906 shock. Seven decades of low seismic activity in Northern California ended with the occurrence between 1979 and 1984 of three quakes with magnitudes of about 6 and the occurrence in 1989 of the devastating Loma Prieta earthquake (magnitude 6.9). 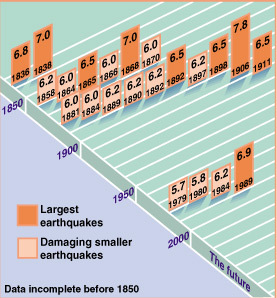 In the 70 years prior to the great 1906 quake, moderate earthquakes were common in the region, and shocks of magnitude 6 to 7 occurred every 10 to 15 years. Scientists believe that a similar period of strong quake activity may now be underway. Because of extensive urban development in Northern California since 1906, the strong earthquakes expected in the coming decades may be very destructive. For example, a magnitude 7 earthquake occurring today on the Hayward Fault (a part of the San Andreas Fault system, along the densely populated eastern side of San Francisco Bay) would likely cause hundreds of deaths and almost $100 billion of damage. In 1999, the USGS reported that there is a 70% chance that one or more quakes of about magnitude 6.7 or larger will occur in the San Francisco Bay area before the year 2030. Future strong temblors in Northern California are inevitable, but the damage they cause can be reduced significantly with adequate preparation. Studies of earthquake shaking, active faults, and the response of structures to shaking have already led to improved building codes and a better understanding of how to reduce the threat posed by earthquakes. In 1990, the USGS, in close cooperation with the Red Cross, United Way, and many other contributors, created a magazine titled The Next Big Earthquake in the Bay Area May Come Sooner Than You ThinkAre You Prepared? This magazine was distributed as a public service by 41 San Francisco Bay area newspapers to more than 2.5 million households. In addition to describing the earthquake risk, the publication advised residents on how to strengthen their homes and protect their families against earthquake shaking. By studying quakes like the Great 1906 San Francisco Earthquake, scientists and engineers gain the knowledge and understanding necessary to assess the risk from future shocks and to reduce the vulnerability of buildings and other structures to damage in these inevitable and terrifying events. In this way they help to protect the lives and property of citizens of the United States. There is a USGS website where you can learn more about earthquakes and how to prepare for them.